I learned Tanya from about age 15, and by no means do I know it like Rabbi Taub thought everyone did....nor do my Lub-born friends know it that well. what little i have tried to learn i have not managed to fathom nevermind internalise. i find it very abstract (for me) and do not have the niggla knowledge i feel is needed as a background to root the concepts properly. it seems to me to resonate with Derech Hashem. To analogize, Rebbe Nachman's Likutei Moharan can be difficult to understand, but we have Reb Nosson's Likutei Tefilot (Prayer lessons, http://www.breslov.org/bookstore/prayer/the-fiftieth-gate-volume-1/prod_10.html), which puts Likutei Moharan's main ideas into easily understandable prayers, and Likutei Eitzot (Advice Lessons, available online at http://www.breslov.org/torah/pdf/Advice.PDF) which collects all the most practical and easy to understand passages in Likutei Moharan into one book. 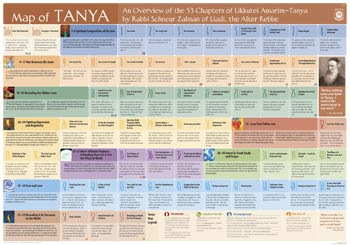 More recently, Rabbi Greenbaum of Azamra.org put together The Essential Rebbe Nachman, which puts a lot of (mostly) easy to understand passages together, providing a very accessible survey of the Rebbe's main ideas and stories (http://www.azamra.org/Product_pages/essential.htm). I think R' Taub's point is that although several of these seforim do exist, they defeat the underlying purpose of structured growth envisioned by the alter rebbe. 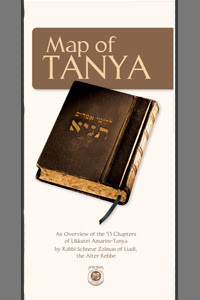 Ironically the tanya was specifically written so that the poshute yidden would understand, at least on some level. Thanks, Menashe -- you're right. If Rabbi Taub's map is a way to capture this growth, why not make a bigger version of the map that has more detailed text, making it even more helpful for beginners? Just an idea. Follow up question for Rabbi Taub: You end your response by saying Tanya has changed your life and the lives of others. How as a practical matter has it changed your life? What do you differently, or how do you think/pray/meditate/interact with others differently? Great question. I made a pretty bold claim and I should have to back it up. So, how has Tanya changed my life? Where do I even begin? One, it changes the way I see reality. The whole system for seeing everything in terms of kedusha and sitra achra gives me a mindfulness and sensitivity to just about everything I do. The chapters on simcha (26-34) has definitely saved my skin countless times. Ch. 32 changed the way I see a Jew. Ch. 37 was the chapter that won me over to Tanya the first time. The first time I learned 37 it literally blew my mind. The whole concept of the actual MECHANICS of HOW we bring moshiach made the concept of moshiach so real and tangible to me. Of course, 41-50 has given me what to meditate on. The first time I read and did the meditation in Ch. 46, I broke into tears and still do sometimes. Thank you, Rabbi Taub -- that is actually very inspiring and motivating. If you do feel like going on and on, feel free!